Lord Mouse and the Kalypso Katz - "Go Calypsonian"
Lord Mouse and the Kalypso Katz "Go Calypsonian" Back to the future: Lord Mouse and the Kalypso Katz revive the red hot chili Calypso sounds from Trinidad on their new record "Go Calypsonian" Put your dresses on and let your ears go on a sweeping music adventure, because the calypso sound is about to take over. Lord Mouse and the Kalypso Katz represent what can be called a multinational family: after four years of wooing crowds around Western Europe, this 7-nation-17-member-band has finally churned the non-stop dancing crowd in Berlin - even without using cheap electronic beats. On the contrary: with their strong, wildly effusive and charmingly quirky personality, they now want you to get to know the Caribbean idea of great music by just giving you the sweet advice to "Go Calypsonian" (Piranha Musik, June 2013). "The Calypsonian vibe gets to everyone and anyone," explains American-born Lord Mouse, the mastermind behind Berlin's unexpected darlings and Europe's only big band calypso orchestra. So whenever this dazzling combination is around, the audience can be sure to get blown away by swaying beats, massive horns, bold lyrics, and a bevy of dapper, rakish suits and bathing-beauty chorus of singing. 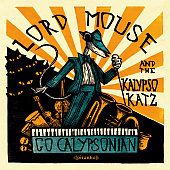 "Go Calypsonian" by Lord Mouse and the Kalypso Katz will be released on 5th of july 2013.